Winter is on the way – that’s for sure! 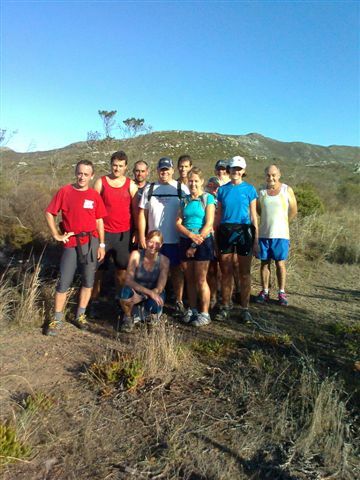 A crisp, stunning day – just a few of us met in Hout Bay for our weekly run. The route selected on the day was a bit different to that originally planned; we ended up doing old faithful instead of the proposed contour path. This was mostly because none of us had run the proposed route before and we opted for the path well traveled as apposed to me getting us lost again. A short 8km’s, car park – old fort – manganese mine – vlakkenberg “waterfall” and home again. A few roadies joined us and we had some wobbly knees at the finish but we will hold the guys to their “I will return” promise. Next week will see a later start. 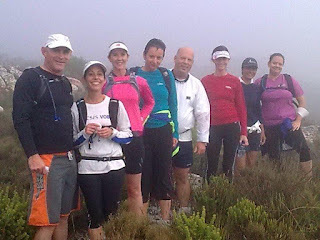 In view of the key Two Oceans events Ultra and Half Marathons, 20Km & 10Km trail runs there will be no trail walk-run group sortie this weekend. To all those participating in these events Good Luck and may you achieve your goal what ever it is. 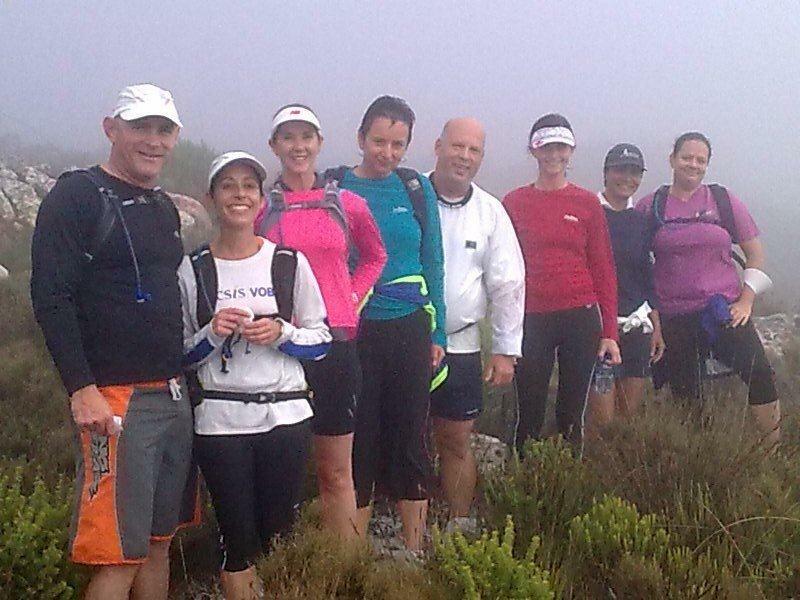 Fourteen runners turned up for a start in a cool blustery South Easter with clouds crawling over the mountain tops. Never the less we started up the path into the cloud and on to the fat lady's cave and over and down towards the aerial farm. On the way we handed two of our group over to Fay's walking group as they were not really kitted out for running. Later three us us took the shorter route back to the start as I had get to the airport within the hour. According to Gaeleen "I think we missed a path somewhere along near St James peak and when it looked like we were on our way down to St Jame's, we checked the map, re-traced our steps and took another direction. Unfortunately I don't know the names of the various rocks, areas etc,. Along this path, one lady had a tumble, but no blood, so no photo -- but sure there will be bruises though. We then came across Tim's group who assured us we were heading down towards Nellie's pool and definitely on the correct path. A lovely run, did just about 10 km, and all 9 of us back to the cars safely together". Gaeleen reports that " 14 of us started out and I led the group at the beginning, then let the faster guys from Tim’s group go ahead. Neil wasn’t feeling great, so he kept Felicity and Sam company as sweep and I stayed in the middle. 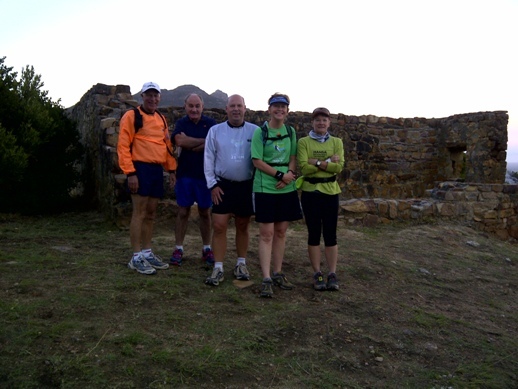 Most of the group bumped into Sandy and her group at the cross roads as they had come up from the Tokai Arboretum. Two of the faster guys decided to go and check out Elephant’s eye after the Fire look-out and caught up with us again at the dam, where Jane left us to join her family for a picnic/breakfast and I am sure a swim. We then took the cycle track back which runs parallel to the river walk, and it was somewhere on this track that Neil had a tumble. All in all we had a lovely run, the weather was beautiful – and my watch showed 9.95 km – so call it 10 km." From the parking area next to the entrance gate a warm-up run along the river walk then a right up the gravel track across the tarred road into the mountain bikers parking area. From there up onto and along Steenberg Ridge across the valley and up to the Elephant’s Eye lookout hut. 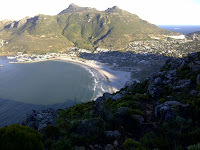 Then along the sandy track to intersect with the path from the head of Blackburn, left and down the escarpment around the head of the dam to the swimming spot and return to the start via the cycle track along the western flank of the valley. We go over the road for a multi peak fiesta around the trails in Silvermine South East. This will also be a 0715 start. 21 turned up in the pre-dawn dark of an early autumn morning for our group run which eventually turned into a challenging pot-pourie because Sandy, suggested that we take advantage of the cool morning to run a longer distance. This was immediately perceived as a challenge by most who enthusiastically endorsed this suggestion. 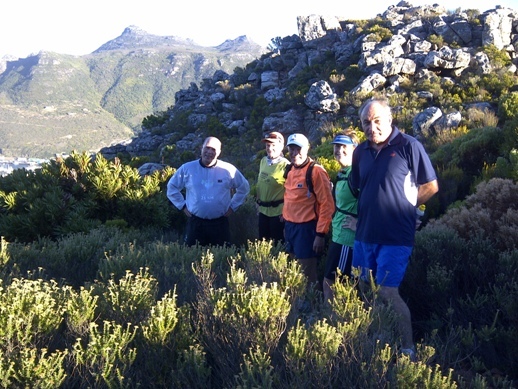 So without further delay we set off at a brisk pace up the winding trail to the upper route and contour path to Skeleton Gorge. Here we parted company with five who had commitments and had to turn back, some seemingly reluctantly. Now the hard work began as we made our way up seemingly endless steps to reach the contour path, then after clambering over rock-falls we discovered a poorly looking Tim- the El Supremo of trail running who was having an infection induced stall. He was being watched over by Di the Acsis VOB club captain who had joined up with Tim's group to sass-out this trail running mania for herself. She decided to join up with us as we were far better company. Tim assured us he would be OK waiting for the long run group to return so we left him contemplating what economic advice he would give the Japanese to aid their recovery. 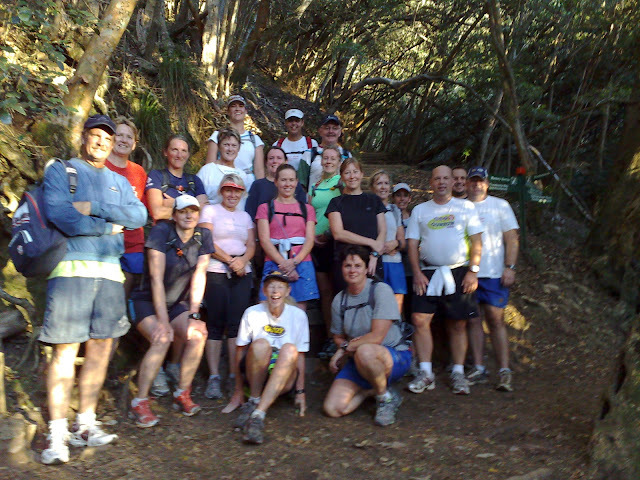 After a flattish jog along the narrow stony path interspersed with running on the boardwalks above Newlands we cut down the Silvertree route and made our way back to Kirstenbosch and after a quick, no instant group discussion, [after all Di was present] decided to forego the easy run home and head back up to the upper path above the gardens and follow the narrow trails cut into the wooded flanks of the mountain back to what remains of Cecelia forest. 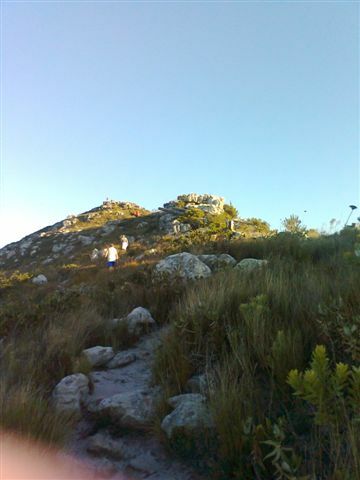 Then through the upper gate, down the steps and back along the upper gravel road past Angela's plaque and down to Constantia Nek. By all accounts a good, somewhat tough yet uneventful run of 12.8 Kms with a running time of 2hrs 18 mins. Although Sam was heard to mutter "Trail run 1: Sam 0"